Vodafone has introduced new bonus card Rs 599, Rs 799 Rs 899 offering unlimited calling and 3G data for its subscribers in West bengal circle. The latest move from Vodafone follows Airtel’s introduction of similar combo STV offering unlimited calling and 4G data. Bonus card Rs 599 offer unlimited Vodafone to Vodafone local calls for 30 days along with 1GB of 3G data. While bonus card Rs 899 offer unlimited local mobile calls to any network and 1GB 3G data for 30 days. 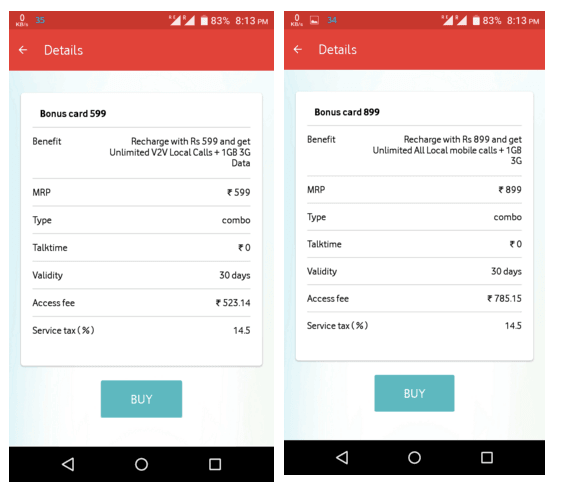 Vodafone has also introduced bonus card Rs 799 offering unlimited Vodafone to Vodafone local+STD calls and 1GB 3G data for 30 days. Earlier Vodafone had introduced unlimited calling bonus card, however it was limited to select customers. Incumbent operator like Airtel and Vodafone are introducing true unlimited calling packs for prepaid subscribers targeting high ARPU voice users. With increase in call drops and high cost of voice packs, many voice customers moved away from traditional mobile network to OTT players who offer free calling over the internet. Did RCom 4G commence for anyone?